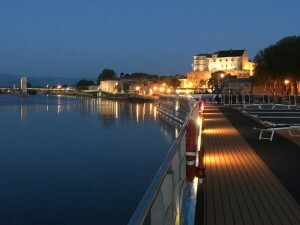 So why choose to river cruise the Rhone? For argument’s sake, let’s say that you’ve narrowed your choices and that you’ve settled on France for your river cruise. You could do the Seine, which is lovely, setting off on your journey on a gorgeous evening from beneath the Eiffel Tower for an adventure that takes you to Normandy and back. See It’s Time To Return To France. You could cruise Bordeaux, a beautiful city that serves as the hub for wine-inspired excursions by bike, hike and motorcoach. 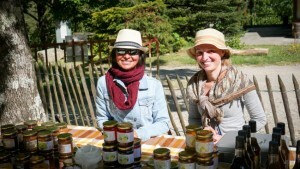 See AmaWaterways ‘Taste Of Bordeaux’. The Rhone is for those who love Provence. 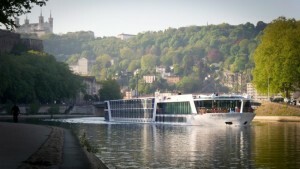 In fact, a Rhone River cruise delivers you to the epicenter of this fascinating region of France. I experienced the Rhone on AmaWaterways during a weeklong voyage from Lyon to Arles. Come along and explore with me some of AmaWaterways’ curated excursions that will help you get the most from your cruise on the Rhone. 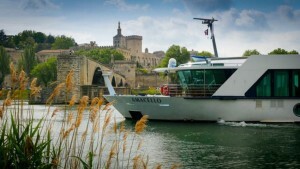 I arrived from Paris via TGV, about two hours, and found my ship, AmaCello, docked at Quai Claude Bernard in Lyon. Cabins would not be available until 3 p.m. so AmaWaterways had organized a fun cooking class in the center of Lyon. Lyon is, in fact, the perfect gateway to a Rhone discovery. France’s third-largest city, Lyon is richly historic. During a walking tour, I explored this beautiful city crossing bridges and strolling along old Roman roads past gorgeous buildings and expansive squares. I discovered remnants of Lyon’s ancient Roman past as well as the city’s contemporary beauty. After a day in Lyon, we cruised the next morning through Lyon and up the Saone River, where we docked for an excursion to the beautiful hilltop village of Oignt. I found Oignt to be a golden opportunity to appreciate France’s medieval architecture. Limestone rich with iron oxide give the buildings in Oingt their trademark yellow hue. Within sight of the village, I discovered the earth’s jewel-toned wines at a gorgeous vineyard where the owners told us about wine production and then invited us for a wine-tasting. The glasses were brimming with fresh-from-the-vine goodness, one of the true pleasures for those who cruise the Rhone. Our next stop was Vienne, which served as an urban center of the Roman empire during the reign of Julius Caesar. A hike to the summit of Mont Pipet provided the perfect panorama over the famed Roman Amphitheater. 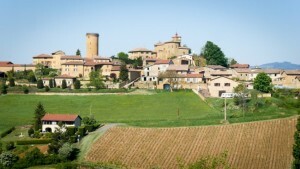 Later, I pedaled with a small group for 16 miles into the surrounding countryside to Condrieu. The guided bike tour along the Rhone was gorgeous and invigorating. In Tournon, I walked across the pedestrian bridge leading to the town of Tain L’Hermitage to hike among verdant, vineyard-strewn hills. Here, the vines are sunkissed by southern rays and graced by the beauty of the Rhone Valley. In Tournon, it’s all about tastes and the wonderful aroma of wine. On another excursion from the town, a local expert took my palate on a decadent journey, balancing the wine’s notes of berries and cloves with the sweetness of chocolate. 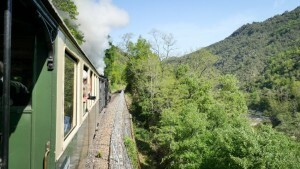 Train lovers could not to better than to chug along on a steam locomotive through a gorge and up to a mountaintop to a small village. 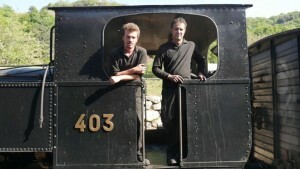 I enjoyed watching the engineers shovel coal into the boiler to turn the train around before beginning a beautiful journey back down the mountain. In Avignon, the highlights are a walking tour of the famed medieval bridge that stretches only halfway across the river and a stroll through the Pope’s Palace …but for those who want to continue epicurean exploration, look no further than the city’s covered market, Les Halles. The labyrinth of cheese wheels, mounds of shellfish, olives, and herb-infused specialties serve as key ingredients for a cooking lesson in Provençal fare. Another must for the Francophile food lover: a visit to Grignan Village, with its beautiful castle, and then onto a local truffle farm to uncover how cute tuber-sniffing canines help harvest these tasty morsels. It’s no wonder that artists were so enamored by this region of Provence. 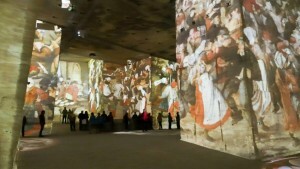 From Arles, we visited an old quarry where masterpieces are projected on a cave-like quarry façade in an unforgettable exhibition of sight and sound. Perhaps no artist conveys the beauty and emotion of Provence like Vincent Van Gogh. During an artist’s tour, I visited the the Saint-Paul Asylum where the self-admitted patient painted some of his famous works. Later I pedaled through Arles to discover the city’s ancient Roman remnants, including a Roman coliseum and the city’s new Roman Museum. For those who appreciate world-class wine, there’s no place like the Rhone. Yet the charms of this region stem far beyond vineyards, with Provençal traditions revealed in its cuisine and crafts, art and architecture. A journey along the Rhone indulges the senses with a variety of experiences, undoubtedly underscoring the river’s singular appeal. Check out AmaWaterways’ seven-night voyages on the Rhone, billed as the Colors of Provence. with cruise-only rates as low as $2,149 per person. Pre- and post-cruise extensions to Barcelona and Paris are available for an additional fee. An avid traveler and an award-winning journalist, Ralph Grizzle produces articles, video and photos that are inspiring and informative, personal and passionate. A journalism graduate of the University of North Carolina at Chapel Hill, Ralph has specialized in travel writing for more than two decades. To read more cruise and port reviews by Ralph Grizzle, visit his website at www.avidcruiser.com.